Learn why big government is not the problem from Professor Kettl and hear strategies to move away from the gridlock fights over government size and scope. “The Progressive government movement, founded on support from Republicans and Democrats alike, reined in corporate trusts and improved the lives of sweatshop workers. It created modern government, from the Federal Reserve to the nation’s budgetary and civil service policies, and most of the programs on which we depend. Ask Americans today and they will tell you that our government has hit a wall of low performance and high distrust, with huge implications for governance in the country. Instead of a focus on government effectiveness, the movement that spawned the idea of government for the people has become known for creating a big government disconnected from citizens. 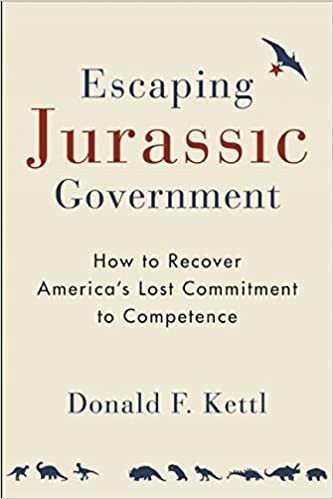 Donald F. Kettl finds that both political parties have contributed to the decline of the Progressive ideal of a commitment to competence. They have both fed gridlock and created a government that does not work the way citizens expect and deserve. Dr. Donald Kettl is a professor and former dean of the School of Public Policy at the University of Maryland. He is also a nonresident senior fellow at the Brookings Institution. As an authority on the management of public organizations, he is the author and editor of twelve books, a regular columnist in Governing, appeared on national television shows, and frequently testifies for Congress. He advised the White House for both Republican and Democrat administrations and consulted for numerous federal agencies. Dr. Kettl has earned many awards, including recognition for outstanding contributions to research, teaching, outreach, and scholarship within public administration and political science.